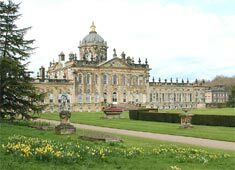 The "Brush and Boot" luxury self-catering appartment or cottage accommodation is to the rear of an 18th century Woodsmans cottage close to Castle Howard (famous as the location for the film and TV series Brideshead Revisited). In a peaceful village location, it is off the beaten track with big views over the Yorkshire Wolds and the Vale Of York, yet just 10 miles away from the historic attractions of York. Guests love our King Size and Super King Size beds with memory foam toppers . The accommodation has Italian marble tiled floors with under floor heating for a cosy winter break or a cool mid summer holiday. 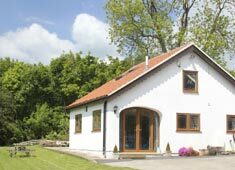 Brush and Boot offers a tranquil woodland setting which is ideal for a 'Get away from it all' country break near Castle Howard and York. Wildlife lovers and bird watchers will appreciate the Roe deer and badger, as well as Buzzards and Hawks and hundreds of native birds visiting our gardens daily. Walkers and cyclists can explore a network of great routes straight from the ivy clad door. The Centenary way runs past the bottom of the drive, and the Yorkshire Moors, North Yorkshire Coast and Yorkshire Dales are all within easy reach. Open plan, well equipped kitchen and living room with flatscreen free view TV and sofas, extendable dining table and whicker armchairs. 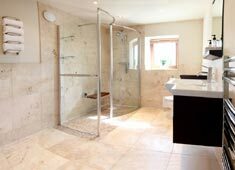 King Sized bedroom and spacious en-suite wet-room with heated marble floors, freeview tv, iPod docker/charger, hair-dryer. 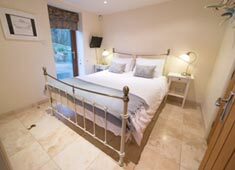 There is another large bedroom with en suite shower room on the first floor which can be added to create sleeping for 4-6 persons if required. This room has great long distance views. Barbecue, Parking, Garden. Free internet access. Pet friendly. B&B also available.